Association of Retired Commissioned Officers – Continuing to foster the fellowship established during service in the Permanent Defence Force. ARCO regrets to inform its members of the death, on Monday 22nd April 2019, of Lieutenant Colonel Christopher (Chris) Browne of Johnstown, Naas, County Kildare and formerly of the Medical Corps. Beloved son of the late Maisie and Dr. Dominick Browne. Grandfather of the late Daniel and Cormac. Sadly missed by his loving wife Mary, sons David, Gerard and Alan, brother Peter, daughter-in-law Elizabeth, grandchildren Aoibhinn, Senan and Niamh, sisters-in-law, brothers-in-law, nieces, nephews, relatives and friends. Reposing at his home on Wednesday from 4pm to 8pm. Funeral Mass on Thursday at 12 noon in Saint Brigid’s Church, Kill, County Kildare followed by Burial in Saint Corban’s Cemetery, Dublin Road, Naas. 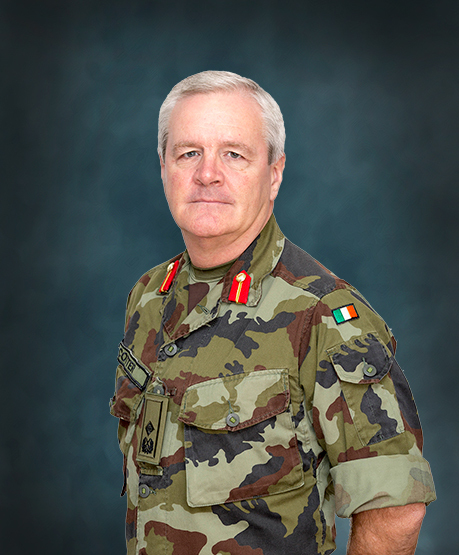 Major General Kevin Cotter, the Deputy Chief of Staff (Support), retires from the Defence Forces on the 1st of April, 2019. During his long and distinguished career, Major General Cotter served in a wide range of appointments, both at home and overseas. A presentation to mark Major General Cotter’s retirement will be held in the Officers’ Mess, McKee Barracks, on Thursday, 28th March 2019 at 1600hrs. His many friends and colleagues in ARCO will wish to be associated with this occasion. Those attending are requested to notify the Mess Secretary, at messsec1@eircom.net or 01 8046194 NLT Thursday, 21st March 2019. A person is an Irish citizen where they were born abroad to an Irish citizen parent. This is the situation that gives Irish citizenship to those children born abroad to Irish Defence Forces officers on duty overseas. In circumstances where the parent is also born outside the island of Ireland (e.g. a child born abroad to an officer on duty overseas), then as a consequence of various changes to and revision of legislation, a range of administrative issues arise when an Irish passport is being sought for that parent’s children (i.e. officers’ grandchildren). These issues are outlined and discussed in the following ARCO Information Brief. In the light of the recent experience of an ARCO member, ARCO strongly recommends that officers, with children born abroad while the officer served on official duty overseas, make themselves aware of the prevailing legislative administrative procedures regarding overseas births. On 29 November, ARCO attended a Revenue Commissioner’s presentation in the Department of Defence, on the new PAYE Modernisation process, which came into effect on 01 January 2019. A document titled PAYE Modernisation was circulated. The Department of Defence has provided ARCO with an information brief circulated by the National Shared Services Office, titled PAYE Modernisation – Notes for Employees, which may be of some relevance to ARCO’s membership. Further information on PAYE Modernisation is available on the Revenue website. The Contributory Pension Scheme for Spouses and Children is a scheme which provides pensions for the spouse and/or dependent children of an officer, or the dependent marital children of an officer who dies in service, or after qualifying for pension. There are two Contributory Spouses and Children’s Pension Schemes: The Original Scheme and the Revised Scheme. During 1985, an option of joining the Revised Scheme, or of retaining their membership of the Original Scheme, was made available to officers. The Original Scheme provides pensions for the spouse and/or the dependent children of an officer who dies in service, or after qualifying for pension. It does not provide pensions for the spouses of marriages occurring after retirement, or for the children resulting from such marriages. 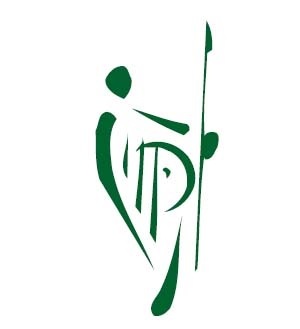 The Revised Scheme provides pension benefits for the spouse and children of the officer and, unlike the Original Scheme, includes provision for the spouse of an officer who marries after retirement, for the children of an officer who are born from such marriages and for non-marital children. If you are unsure whether you are covered for Spouses’ and Children’s benefits or which Scheme you may be a member of, then you should check with Pensions Administration, Finance Section, Department of Defence. An ARCO Information Brief on the scheme is available HERE and provides details of the two schemes in a format that is easy to understand. The brief also contains contact information for those wishing to make enquiries, along with details of the Appeal Mechanism for those who have been deemed by the Department of Defence as not qualifying for a pension. 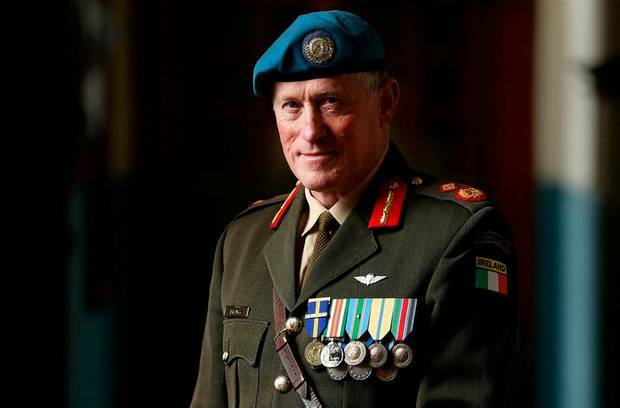 Major General Mick Beary retired recently from the Defence Forces after almost 45 years service. During his career he served in a wide variety of units and appointments. At home these included: School Commandant of the Command and Staff School, Director of Training, Commandant of the Military College and General Officer Commanding 2 Brigade. His overseas service included: Company Commander A Company 76 Infantry Battalion UNIFIL, Office of the Chief of Staff UNPROFOR, Intelligence Branch UNIKOM, Operations Section ISAF, Intelligence Branch EUMS, Mission Commander EU Training Mission Somalia, and Head of Mission and Force Commander UNIFIL. As a mark of appreciation to Major General Beary, and in recognition of his long and distinguished service, it is proposed to hold a retirement function at 1600hrs on Thursday 15 November 2018 in Cathal Brugha Barracks Officers’ Mess, Rathmines, Dublin. 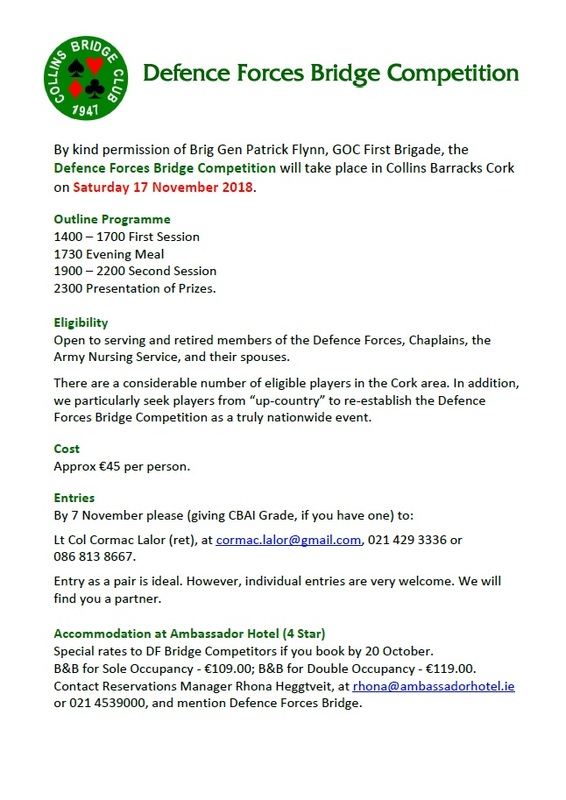 Mick’s many friends in ARCO who wish to attend the function, or to send messages, should notify the Mess Secretary or Mess Sergeant, Cathal Brugha Barracks Officers Mess via email at: shane.heffernan@defenceforces.ie or phone via: 01 8046460 or 01 8046355, not later than 1630hrs on Friday 09 November 2018.